As most of our readers know, we're big fans of creating signature drinks for wedding receptions. If you are thinking about coming up with a cocktail for your own reception, I recently tried something that might be very appropriate ingredient. 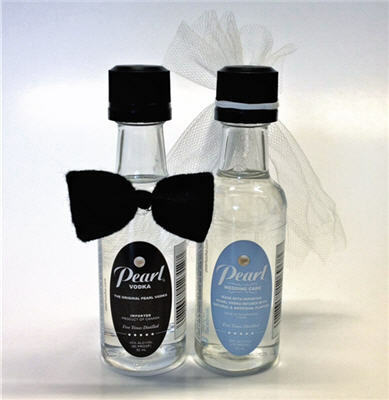 It's Pearl Vodka's new flavor "Wedding Cake". When I sipped it, my first thought was, "Yes. No doubt about it. It definitely tastes like a wedding." It was sweet, light, and fluffy, with a hint of vanilla and buttercream. 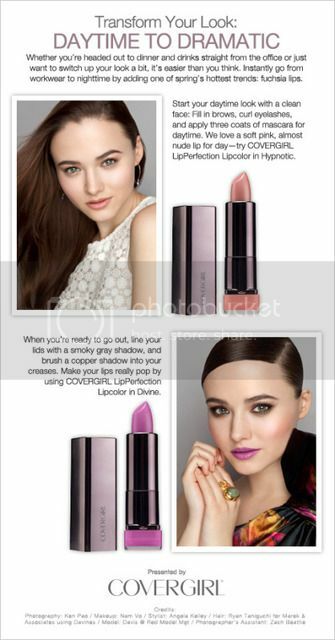 I recommend it. It would be great with any of the less-sweet fruit juices, or with ingredients like blue curacao or grenadine. Once you have this as your base, odds are you'll be able to create something really yummy for your guests. I know, because I had a great time testing it out for you. I'm told Wedding Cake will also be available in wedding favor sizes in the near future. If you're interested in more information, visit Pearl Wedding Cake. Your wedding day is a celebration of two lives coming together, and there are 3 great ways to make sure your autumn wedding plans “fall” right into place this season! This year Mother Nature’s fall bounty can be found in weddings from coast to coast. 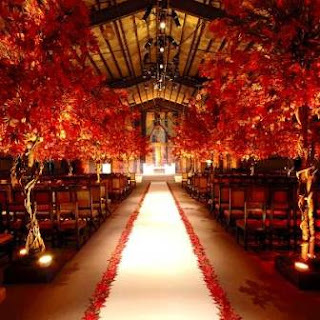 From the vibrant colors, to the food in season …… we have your autumn wedding basics covered for 2012. 1. Autumn Color Selections: Let’s face it; selecting wedding colors can be tricky, but autumn wedding’s offer natural hints when it comes to the “color schemes” and selection. Rich, natural and earth tones are wildly popular choices when it comes to autumn weddings this year. Color schemes such as: orange and green, brown and orange or purple and green, are top contenders for 2012’s most popular picks. Plus, using natural and earthy décor such as wooden cake plates (that can often be found at thrift stores) and painted to match your special day are great ways to incorporate any color into your special day. Also consider using slices of tree bark for a rustic look. 2. Appreciation for the outdoors: Fall weather is often more temperate than summer and yet still warm enough to enjoy the outdoors. Why not think outside of the box for a personal and fun wedding venue? Is there a park nearby where you and your partner take walks? Getting married under a large oak tree with white lights and chairs arranged in rows can make for a magical celebration. Perhaps you know someone with a rustic barn or you’re lucky enough to live near the ocean. By adding in a few handmade signs with your own personal message, some warm candles and fresh flowers, a simple outdoor location can become a magical backdrop for your special day. 3. Fall Harvest & Food: Let the bounty of fall’s beauty influence your wedding from tabletop to bouquet. This autumn we’ll see bouquets and floral arrangements full of richly colored roses in hues from orange to burgundy. Succulents are the rage right now and add a modern look to fall bouquets and centerpieces. And don’t forget the men’s boutonnieres! Succulents, herbs and even a fiddlehead fern add the perfect autumn touch to your wedding. And for the finishing touch? Use fresh fall fruits, such as grapes, sugar apples and cranberries to bring fall’s natural beautify to each table setting.